Pelican 1500 Protector Medium Case Polypropylene Black 18.5 x 14.06 in. x 6.93 in. (Exterior) in. Pelicans Protector Medium Case features a retractable extension handle and strong polyurethane wheels with stainless steel bearings. It has easy open double throw latches open cell core with solid wall design Oring seal and automatic pressure equalization valve. 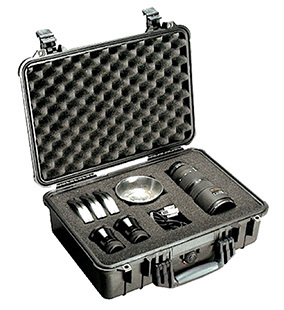 This case also features comfortable rubber overmolded top and side handles stainless steel hardware and padlock protectors convoluted lid foam and interior dimensions of 16.75 x 11.18" x 6.12"."